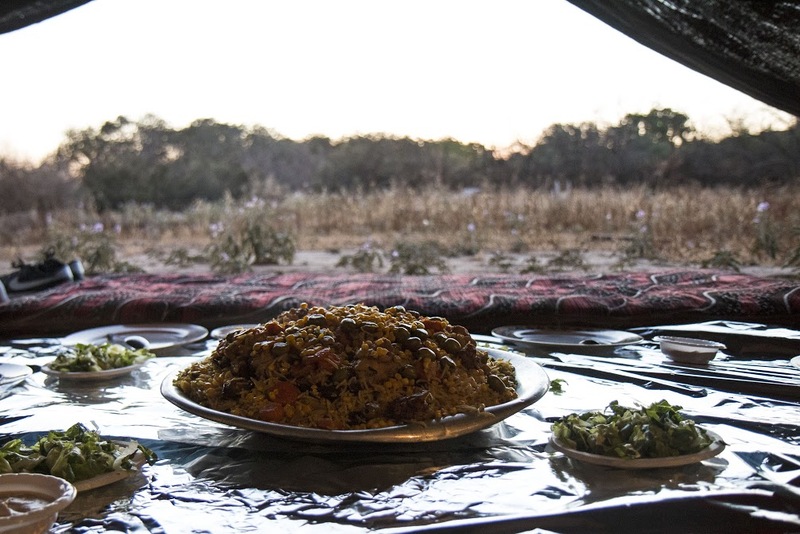 TEL SHEVA, Israel – Just after sundown, a lone birdcall is carried on the desert wind into a Bedouin tent where Sohayla Abo-Rkeek has prepared an iftar meal for her first group of paying guests. She pours tea brewed with mint and lemongrass, and arranges a tray of tamarind pastries as the guests laugh and serve each other rice, chicken and tahini from heaping silver platters. 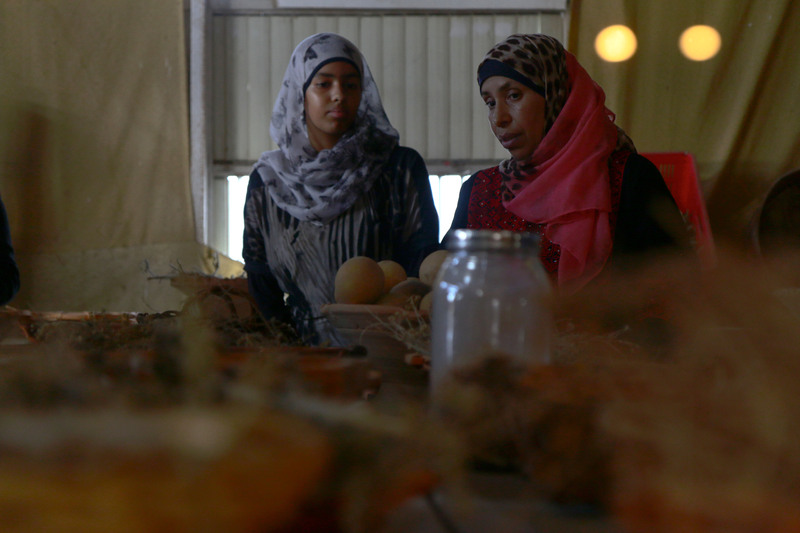 Abo-Rkeek, 46, is one of a modest but growing number of Bedouin women establishing small businesses in Israel’s Negev region, the southern desert area that covers more than half of the country’s territory. After pouring coffee, content that everything’s done for the moment, she kneels in a corner of the tent. Abo-Rkeek’s is a dream that once seemed impossible. Her transition from a wife confined at home to business owner has been difficult, firmly opposed by her husband and local tradition. The Bedouin are a deeply conservative Muslim community, and women are expected to stay at home and raise children, not work. 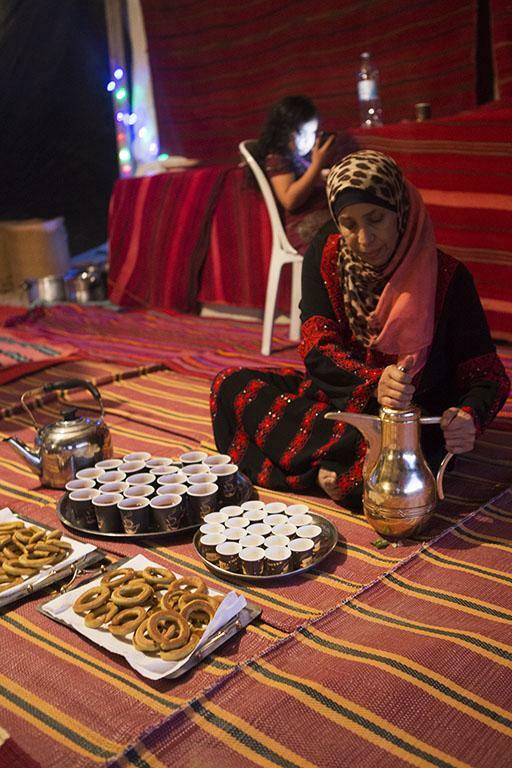 The choices Abo-Rkeek has made, first to work and eventually to start her own Bedouin hospitality business, have caused continual strife in her marriage. But with the power that comes from making her own money, she says her husband can’t do anything about it now. And other women are following her lead. Abo-Rkeek started working for her younger sister Mariam 11 years ago, shortly after Mariam founded Desert Daughter, a line of natural cosmetics and medicinal treatments made with recipes passed down from their grandmother. Mariam, 45, says it’s the first line of Bedouin cosmetics. She was unmarried when she founded the company because she refused to accept an arranged marriage. The sisters’ community thought Mariam was “crazy” for starting a business, but the struggle to work was even more tumultuous for Sohayla as a married woman. “My husband was all the time against the job,” Sohayla says, explaining that no women in his family had ever worked before. But she had stayed at home raising a son and five daughters for the first 10 years of their marriage, and saw the opportunity to work with Mariam as the “one chance” in her life. Sohayla’s husband kicked her out of the house when she told him that she had been secretly working for Mariam for two months. She was eventually able to move back from her father’s home, where she took refuge with her children, without giving up the job, but has left her husband’s household during various disputes another three times over the years. Sohayla says she leaves in order to advocate for staying at work, or to fight for her daughters’ education. The Bedouin are a traditionally nomadic Arab group of tribes who represent a minority within a minority in Israel, where 1 out of 5 citizens is Arab. Bedouin make up just 3 percent of Israel’s total population, and are widely recognized as the most economically disadvantaged community in the country. Bedouin also have the highest school dropout rates in Israel, and polygamy is still practiced by a quarter of the population, according to the Israeli Knesset’s estimate, despite being outlawed since 1977. Looking to earn more than she did just working for Mariam, Sohayla found support to start her own business earlier this year at a Riyan Arab Employment Center. 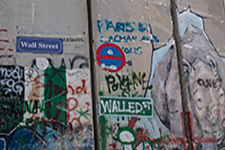 Riyan is a network partially funded by the Israeli government that provides a range of services, from job searching to business counseling, for Israeli-Arabs. That’s where she met Soher Zaatra, a former bank manager and Israeli-Arab woman who now gives business advice to entrepreneurs here. 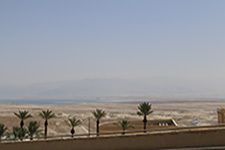 Zaatra travels the 1.5 hours south from Jerusalem to the Negev two to four times a week. Zaatra says that the key to cultural acceptability for Bedouin women entrepreneurs is to run a business from inside the home. So Sohayla and Mariam are taking the “very, very difficult” route of working outside of their houses – Mariam converted her brother’s old garage into the space she now uses as a workshop and gift shop for Desert Daughter. 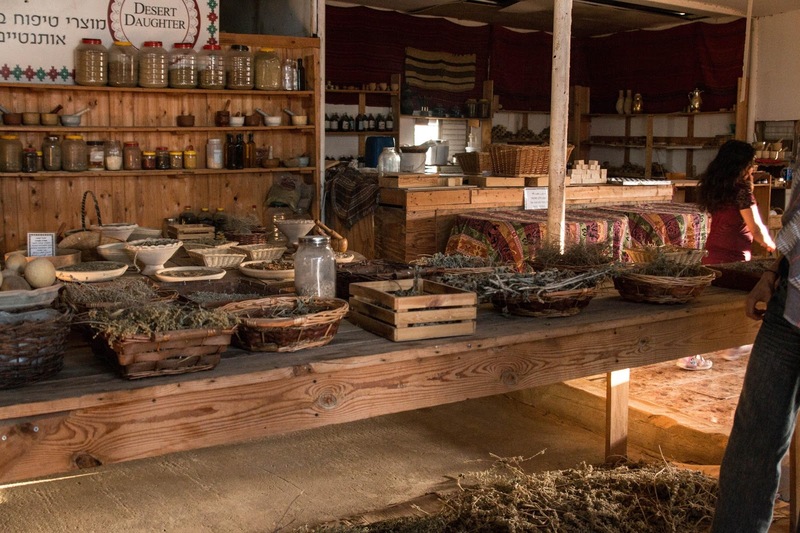 She also erected the neighboring visitor’s center and tent that Sohayla will now use to host tourist and educational groups for talks about Bedouin culture and traditional meals. But the women don’t live on the premises. Sohayla’s business is also unusual in that most Bedouin businesses that get support from the government are owned by men, according to Yariv Man, the senior division manager of the Bedouin Development and Settlement Authority within Israel’s Ministry of Agriculture and Rural Development. “But we hope that we will see more women sign businesses under their name and lead these businesses,” said Man, stressing that greater inclusion of women in both education and the workforce will have positive impacts on Bedouin society, from better governance to combatting polygamy. “We want the Bedouin community to have the opportunities that my children have,” he said. One way the Israeli government is trying to make that happen is through a second successive five-year plan to promote the economic development of the Negev Bedouin. The plan was adopted in February 2017, and allocates NIS 23 million ($6.5 million) specifically to supporting small and medium-sized businesses. Mariam, the original business owner of the Abo-Rkeek sisters, says she sees some important differences for women who want to work or start businesses today compared to when she started out. In the early days of her venture, she had trouble finding just one other woman whose husband would let her come and work. Today, she employs five, including Sohayla. She also remembers when Bedouin women weren’t allowed to have their own phone number. On the evening of Sohayla’s iftar, one of Mariam’s young nieces repeatedly asked to use her mom’s cell phone until getting her way and settling down to play a game. Mariam was inspired to establish Desert Daughter while she was studying for her bachelor’s degree in marketing at Luton University (now the University of Bedfordshire) in England. It was a highly unusual opportunity for a woman of the Negev to study abroad, and was made possible by a grant that an English teacher whom Mariam took private lessons with while in school helped her secure. Mariam also broke with Bedouin tradition by staying single until three years ago, when she married at 42 to a man 10 years younger. In England, Mariam noticed that people were getting more and more interested in natural medicine and organic products. “So when I went back to Tel Sheva, the first thing I decided to do was to sit with my grandmother and document her knowledge,” she said. And now she’s passing some of that traditional knowledge on to a group of young women aged 13-18, as part of a program she founded called “We are Leaders.” The curriculum also facilitates English and Hebrew lessons, and teaches participants about the importance of engaging in civil society. Mariam still feels like Bedouin women lack a voice, and that they need more financial independence, but she doesn’t have to look too far to see gradual cultural changes at work. Sohayla recently stood up to her husband and insisted that her 18-year-old daughter, Kaothar, be allowed to finish school and go on to university. She’ll start her nursing studies in the nearby city of Be’er Sheva this fall. Sohayla’s also living with her husband again, and says that she feels stronger in the relationship because of the money she earns for herself. Before she started working, she was entirely dependent on his decisions – but now she can stand up to him.